The true pleasure of a welsh dresser is in the detail, the functionality and the integration into daily life. 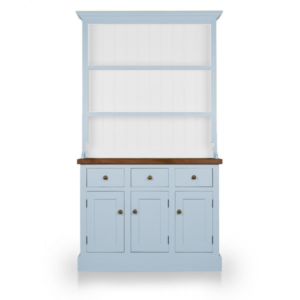 A welsh dresser can easily become the pinnacle point in a kitchen or dining room, with showstopping china or an inspiring workstation. Our customers design and install many dressers to suit their precise requirements so as a homage to those beautiful people, we look at our five favourite welsh dressers as designed by our customers and shown on our website. As you’ll probably have realised we have a passion for all things handmade and unique, we simply adore old and antique furniture, so if like us you adore the charm of these types of pieces you can check out some gorgeous inspiration designs online. If you’re not sprung on these but fancy a different overall appearance, call us on 01538 380 988 to discuss your bespoke options. You can find more information on dresser configurations and options here, this may give you some inspiration before you call us. 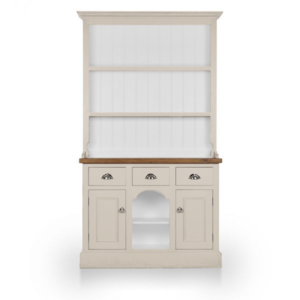 Small but mighty this one, one of our single dressers that we’ve handcrafted for our customers, this traditional design originates from New England shaker kitchen furniture. Featuring open racks, a dovetail drawer and a single cupboard door, the finished unit provides the perfect storage of display unit with the versatility to move anywhere in the house. 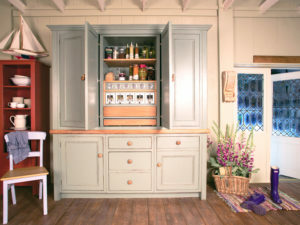 Customise by changing the colour, add closed doors, interior wood and bespoke handles. Standing to attention, this dog kennel dresser commands the room. 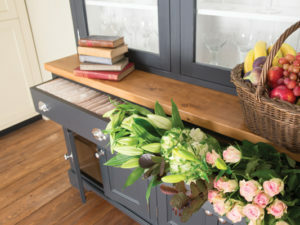 A classic feature in an English kitchen, this dresser is both beautiful and functional. We no longer feature animals in dog shaped spaces but the name has remained synonymous with the design element of the open area in the middle centre. 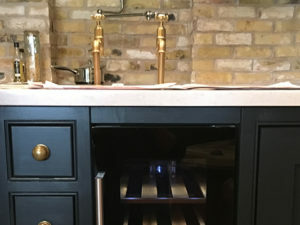 Customise your own with rich dark blues, copper handles and white internal wood. You could even add slated shelving or glazed widows to finish the look. 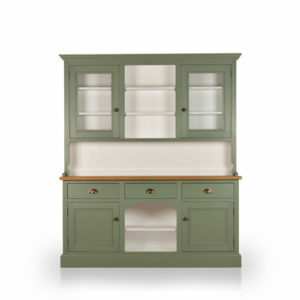 Dressers portray excellent build, quality, choice and design by retaining all of the original features of a traditional English kitchen, while a glazed top allows owners to showcase their possessions with protection and a finished appearance. With sturdy drawers, a choice of door inlay styles and a wide range of colours, customisation is simple. Choose a rustic but on trend grey, paired with a dark walnut top and brushed chrome handles for a fusion of old and new styles. 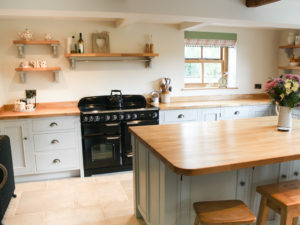 Synonymous with farmhouse kitchens, of yesteryear and to reflect the modern take on rustic farmhouse, the triple welsh dresser radiates this popular style. Offering form and functionality, the three drawer and cupboard strong storage unit has space saving in the bag. For a bright decorative piece in the home, choose a meadow silk finish with brass handles and a waxed pine top. Finally on our top spot, we can’t talk about dressers without mentioning the modern masterpiece of the Mudd & Co large triple dresser. With three extra large cupboards and drawers, wide open glazed cupboard tops and a vast amount of counter space, this unit is designed with function and style in mind. Choose our favourite, Staffordshire Clay with sugden door inlays and iron handles for a strong imposing look. We’re delighted to work with our customers to design and handcraft from scratch, their dream dresser, knowing that they will appreciate the expert and artisan craftsmanship that goes into each product. If you’re not a fan of our listed dressers but you have one in mind to suit your style, contact us on 01538 380988 and we’ll be happy to talk it through with you. 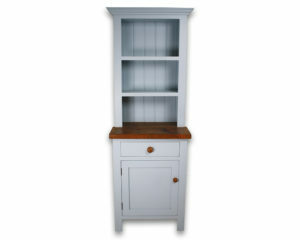 Interested in a bespoke dresser or cabinet? 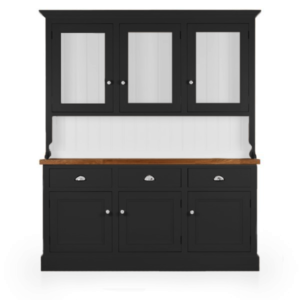 Visit our dresser configurations and options to discover what we can do for you. What do you need from your dresser?